The beautiful, creative and amazingly talented Katharine Peachey of www.peacheyphotography.co.uk came to take some photos of my apartment (very exciting). 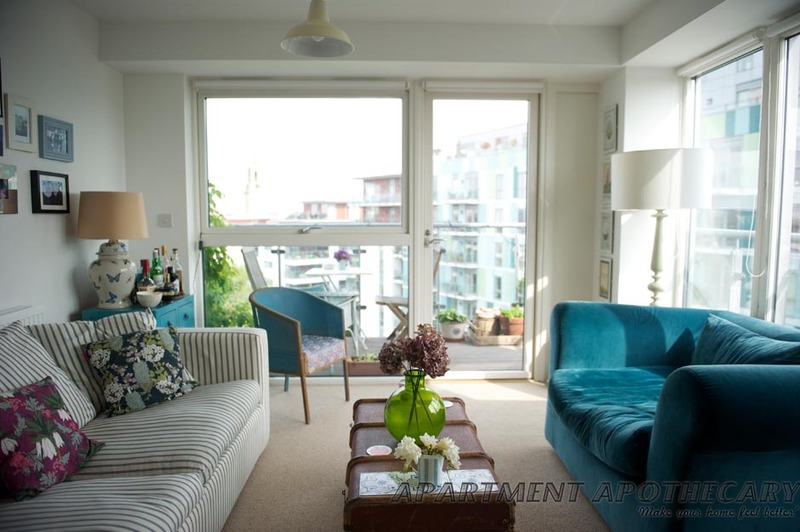 My apartment is in Bermondsey, which has recently become quite a trendy spot right next to the river Thames, east of Tower Bridge. Bermondsey itself used to be an industrial area and a rail track runs through it with amazing arches, which is the home to Maltby Street Market. There are also lots of perfectly restored factories and warehouses, which is my dream home. However, my apartment is one of the many brand new developments in this area. Whilst new homes have their advantages, one of the major problems is that they can end up feeling soulless and clinical due to the hard edges, white walls and box-like rooms. I have loved the challenge of trying to fill my home with furniture and possessions that reflect both the newness of the building whilst also combining the old and the longed for period home I desire. I have also had to work with limited funds as moving house is so expensive; I’ve used furnishings from my old studio apartment, updated them or picked up bargains where I could. Hopefully, you will like the results. My apartment has lots of windows, which is a rarity in new builds. I have tried not to include any furniture that absorb too much of the light otherwise an already smallish property becomes very small, very quickly. I decided to use the large teal loveseat as a basis for the colour scheme. I’ve tried to fill the sitting room with a combination of old and new. This antique chair was an ebay bargain at £20 and helped to emphasise the teal colour of the loveseat but this looks more incidental than planned as these pieces of furniture are from toally different periods. I upcycled my mum’s school trunk to make a coffee table. This Habitat spindle lamp is one of my favourite purchases of all time. It can be used in any room because of the colour and style. The silk shade emits a beautiful soft light, which is so important in a stark, white apartment. I have filled my balcony with potted plants and they sit in vintage crates to add to the old and new theme I have in my apartment. 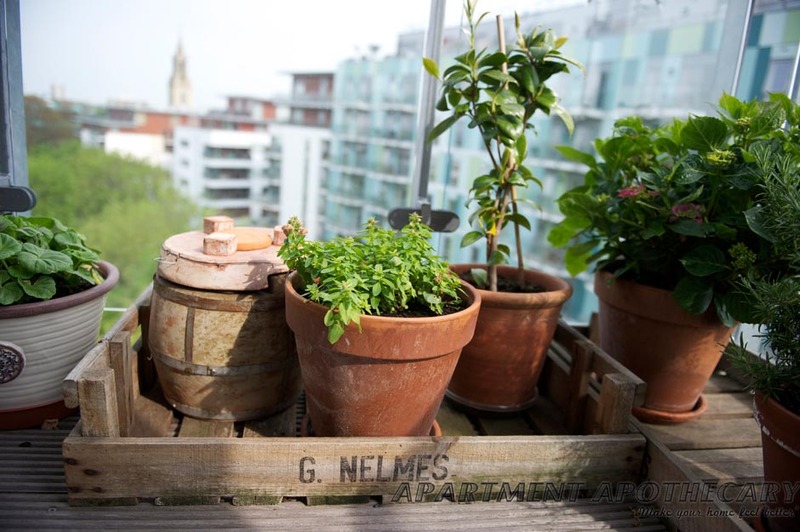 I always think of my balcony as an extension to my sitting room so it is important I style it as I do the interior. I picked these Ercol dining chairs off the street (so lucky!) and the nineteenth century table is from a French flea market. 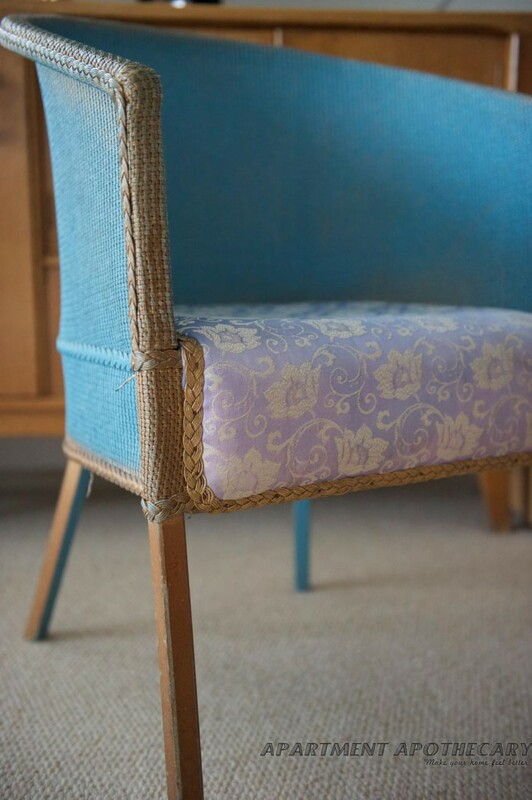 Mid-century furniture, like Ercol, can blend with older furniture, as well as new. Ikea cushions on the chairs don’t even seem out of place. I bought this antique mirror from Camden Passage and this also picks out the teal from the chairs in the room. I use postcards to add interest. I’ve tried to soften the hard edges of a new, modern kitchen with vintage finds like the Bush radio, old tins, saltcellar and glassware. 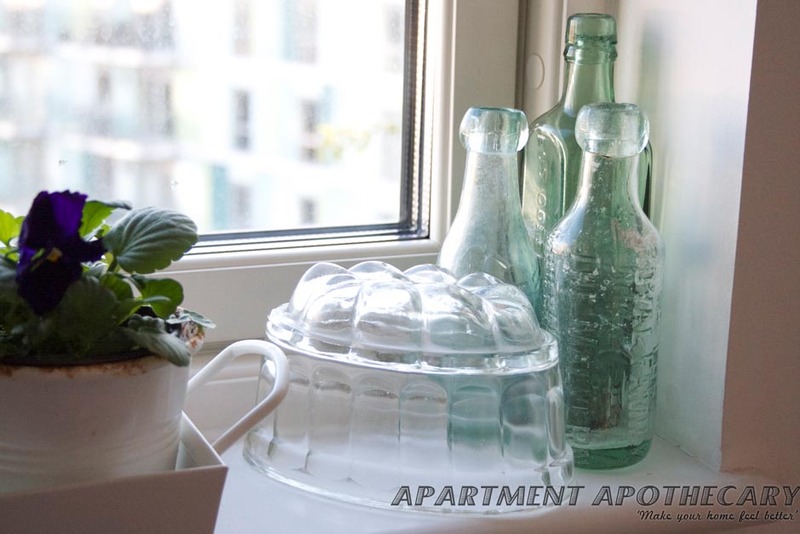 Old jelly mould and glass bottles are perfect to sit on the kitchen window sill as they still allow the light to come through. 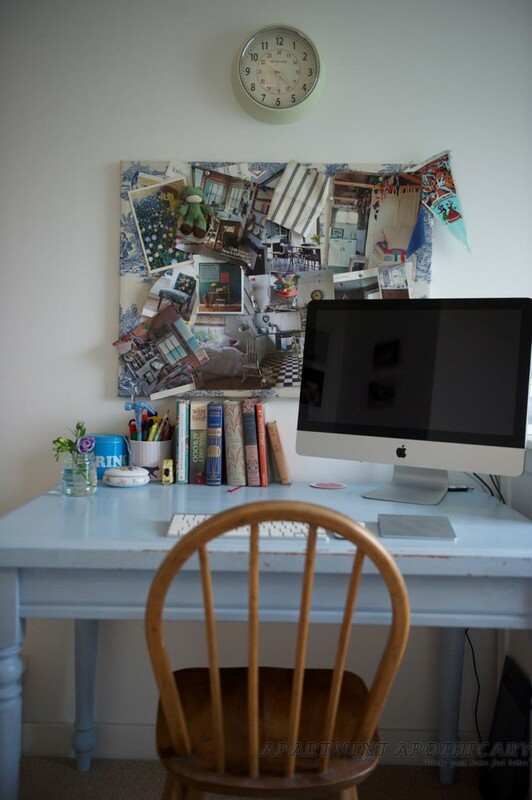 Whilst wanting to display vintage finds it’s also important to not overcrowd a small kitchen and valuable workspace. 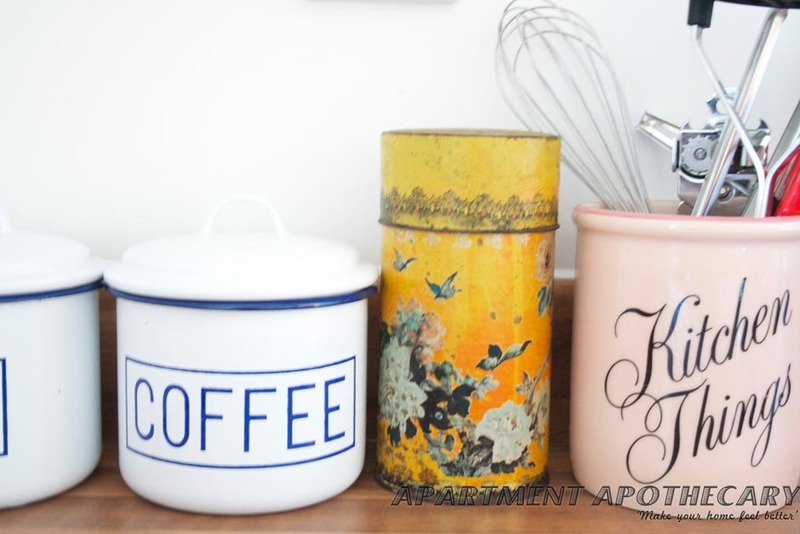 A collection of different storage pots breaks up the uniformity of a modern kitchen. 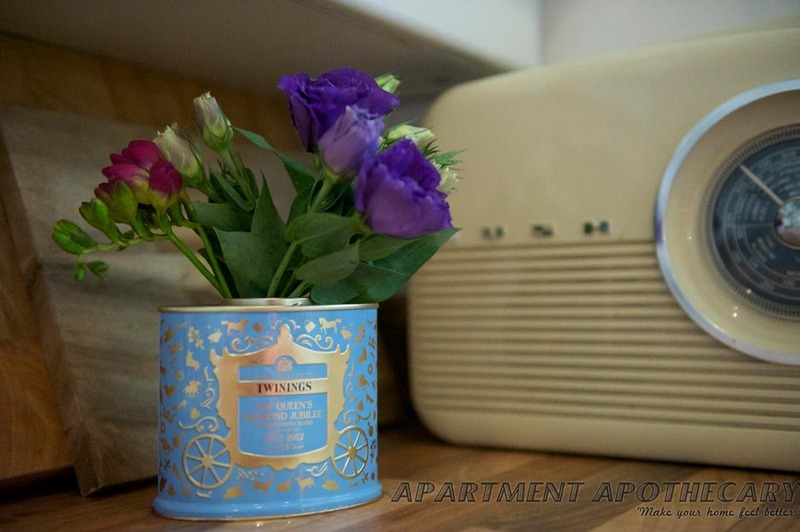 I love vintage tins and and this one makes a perfect vase. I removed the kitchen cupboard to show off the crockery that I love. 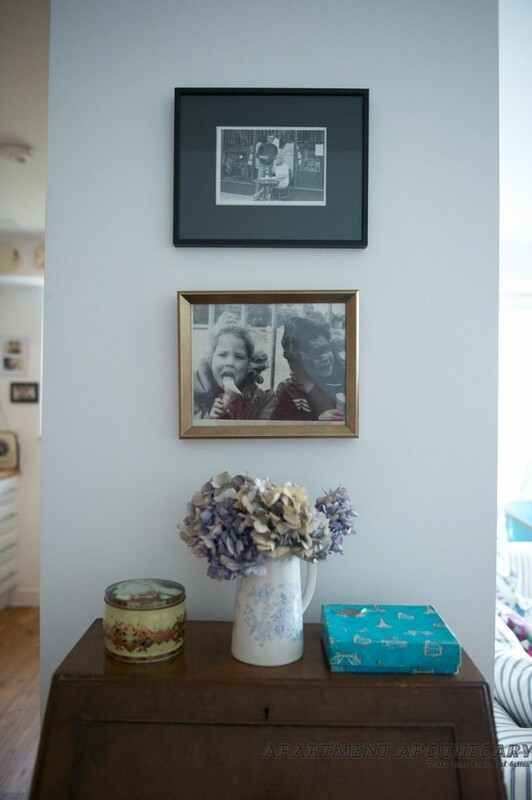 Framed family photographs are hung above an antique writing desk that I was given for my seventh birthday. I made the pinboard above the desk for inspiration and I made sure the computer is the only sign of modern technology as I didn’t want this to feel like an office with a bed in it. Old books, flowers and childhood pots personalise the room. A functional Bakelite phone ensures modern technology is not overbearing in this room. I have used duck egg blue as the accent colour in the master bedroom. 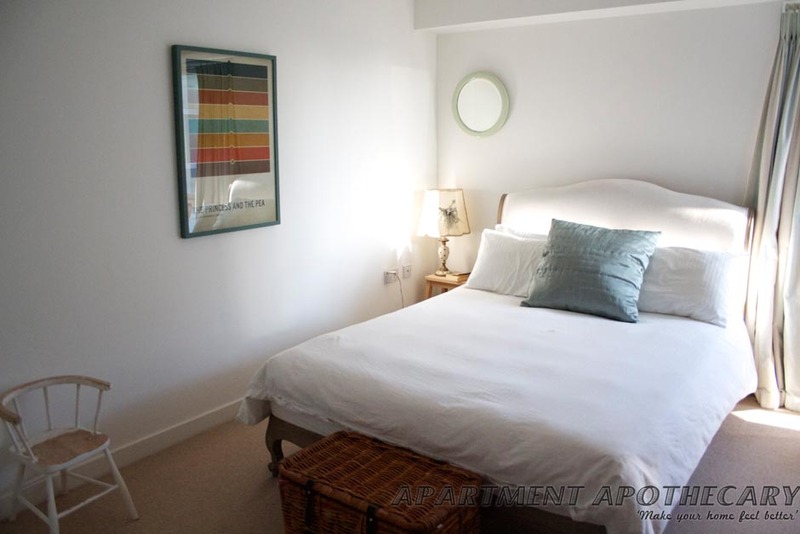 It is picked up in the stripes of the bed linen, the mirror, the cushion, the framed print and the stripes of the curtains. 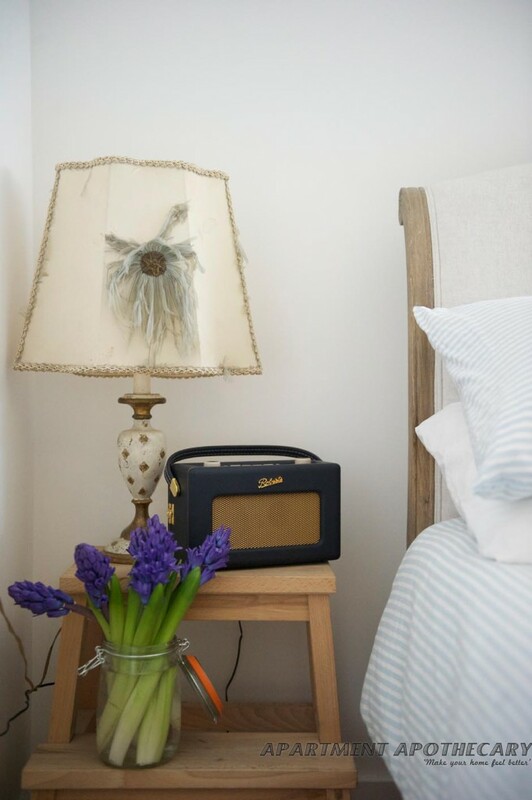 I can get away with using £6 Ikea steps as a bedside table because the Roberts radio and my late grandmother’s 50 year old silk lamp draw all the attention. The bed was one of the new purchases I made. It is a clever mix of old and new from Loaf, which I love. My late grandma’s chair that she covered in Sanderson fabric sits proudly in the window of my bedroom. The tailor made curtains were one of my splurges (I don’t think I can admit how much they cost!) but they tie in with the colours of the chair perfectly. An Ikea cushion looks as old as the chair itself. 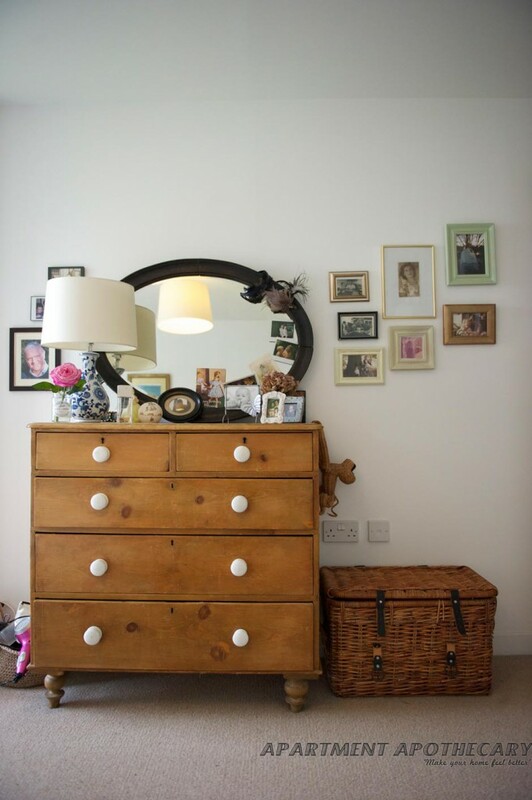 I bought these antique Victorian pine drawers from ebay for £100. 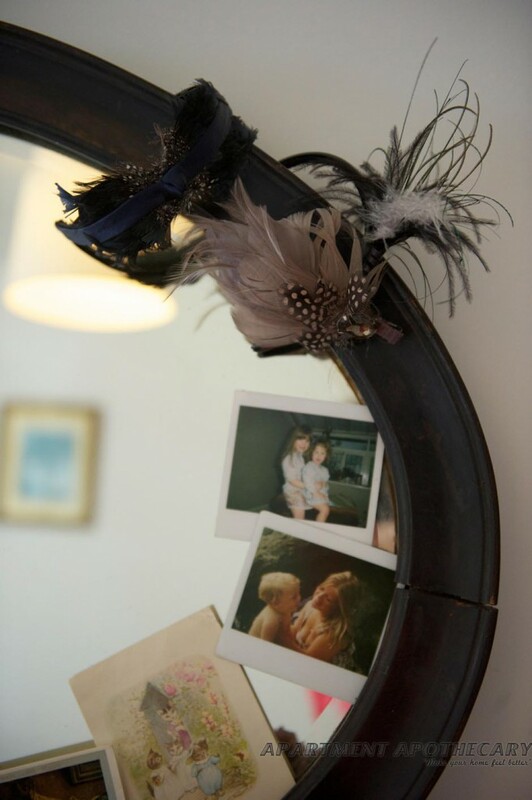 The family photographs and my parents’ old mirror add to my bedroom’s antique feel. 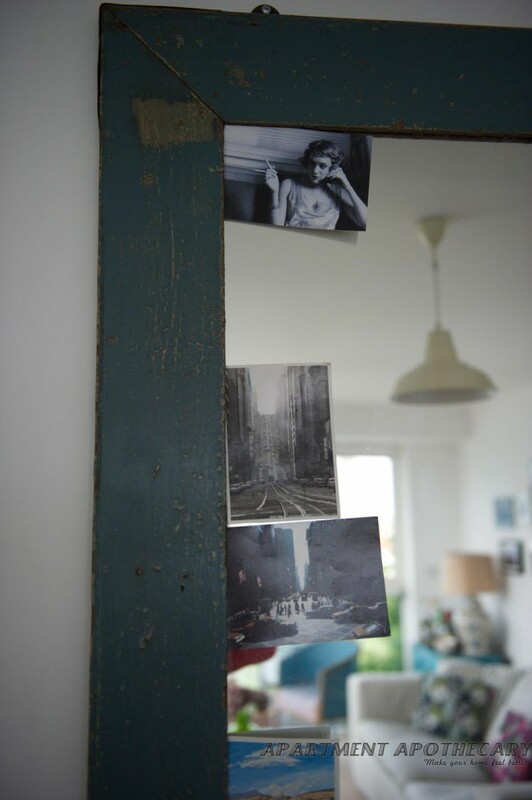 I always cover mirror in photos or postcards as this makes them more personal. 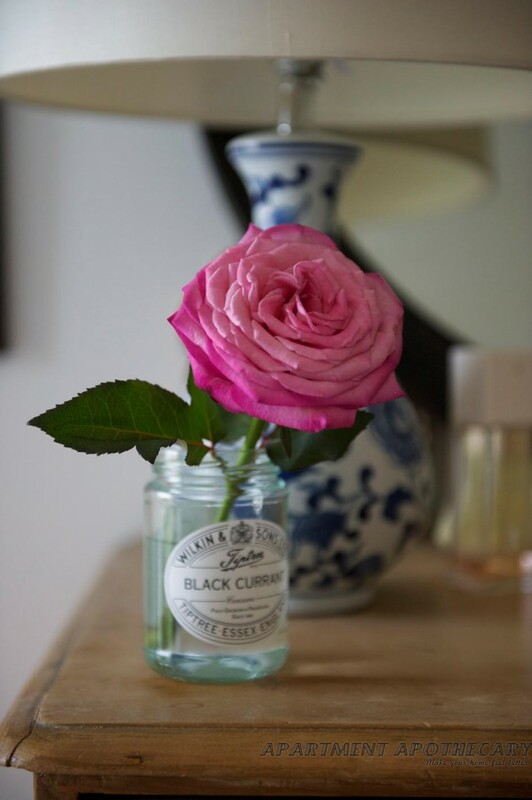 Fresh flowers in a house are transformative. I removed the door from this cupboard and put up shelves. I stuff these with all my knick knacks which adds character to a new build. 1. Don’t be afraid to combine styles e.g. modern, mid-century, Victorian. 2. Add colour as a totally neutral palette adds to that ‘brand new’ feeling. However, try not to to colour coordinate in an obvious way e.g. buy one new item and an antique item in the same colour so they don’t ‘match’. 3. 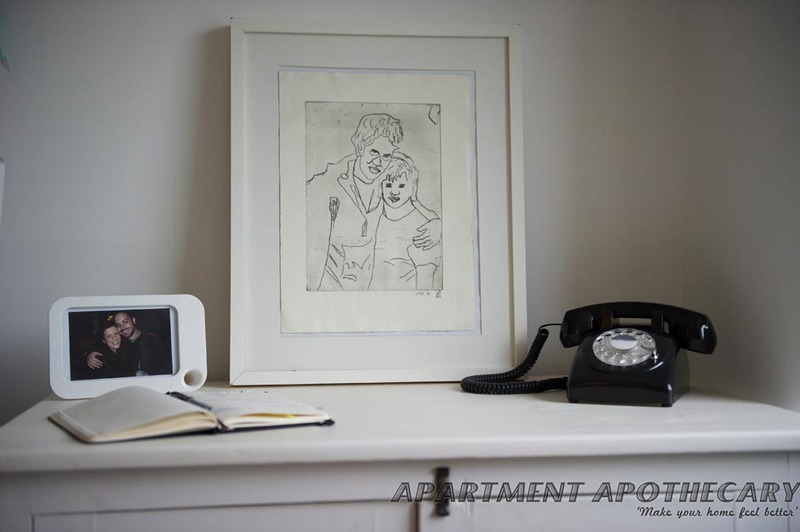 Personalise your home with photographs, postcards, possessions, paintings. Without these things there can be no soul in your home. 4. Use vintage finds and vintage textiles to soften the hard edges of a new home. 5. Make the most of any outside space to prevent your home feeling soulless and sterile. 6. Use soft lighting to help warm up stark white walls; always use table and standard lamps rather than ceiling lights. What a lovely site! great ideas and photos! Could you do the same to my boat please? I’ll give a free pleasure cruise to Enfield in return! Now that is an offer I can’t turn down! Amazing. You make it all seem easy and effortless! You definitely should do this full time. I am heading to the cellar now to dig out stuff! What an inspirational site! And what a lovely home you have made, Katy. I am starting a big sort out with a view to selling my house. 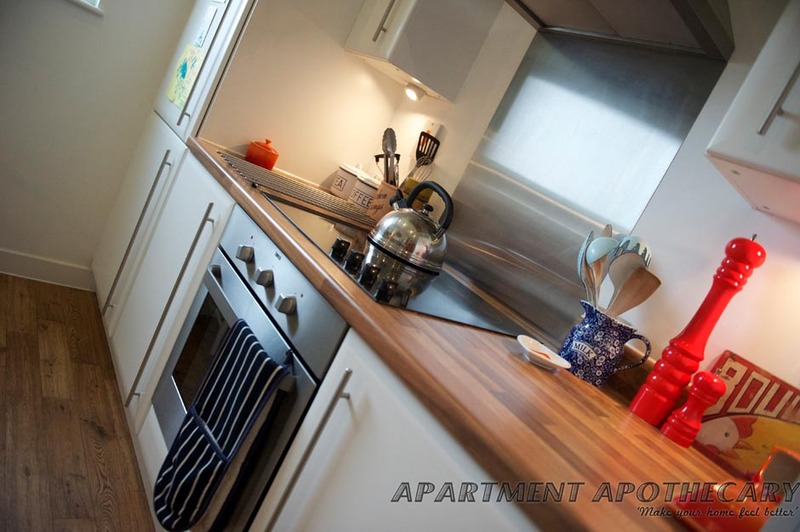 Your site will be invaluable for that and then I can take forward ideas for my new place! Great photography too on your website. You make a good team. Oh Katy I’ve always said your flat is more beautiful than ours and now the internet agrees with me. Gorgeous! love spending time on your website and look forward to all the new blogs! Brilliant. 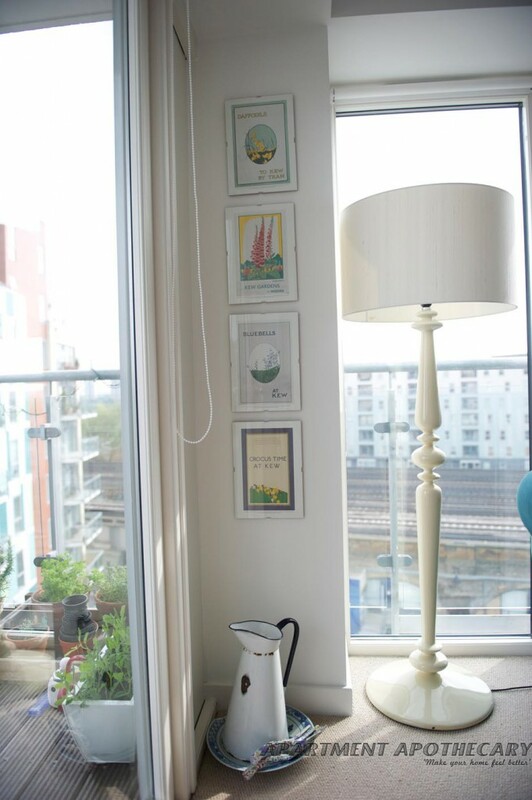 love the pin board, and the various flower pots-they’re such simple and adorable way to make any space more alive. 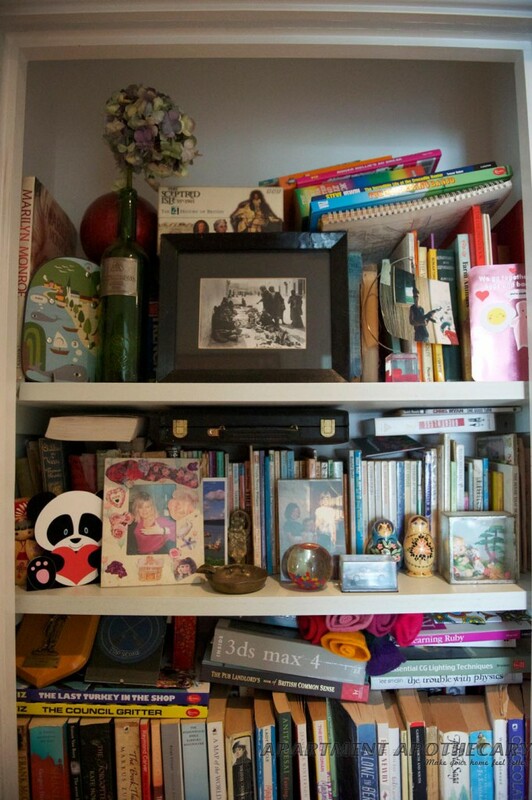 also love the bookshelf and grandma’s lamp-charming! 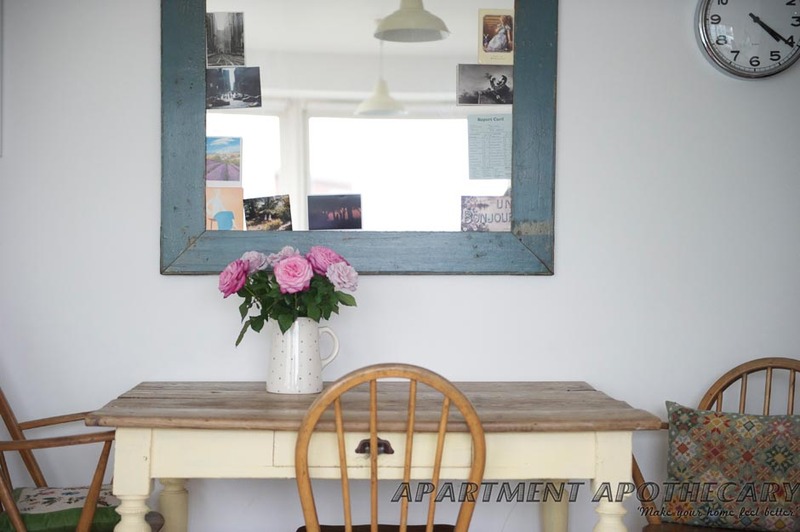 i’ll be coming back to your blog to get inspired by your beautiful flat and all those little details that make it so ever pleasant. Such a lovely, inviting home – you have created a really special place and I’m going to steal all your ideas! You inspired me to spend 2 days de-cluttering! 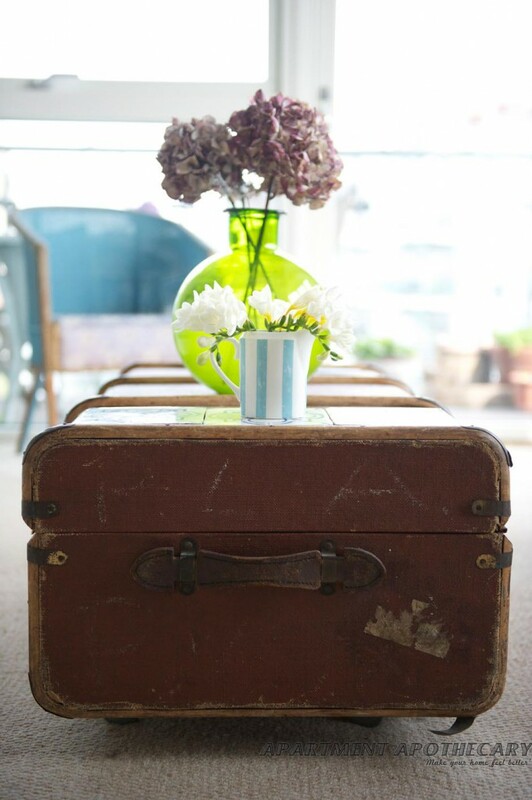 I really like the way you upcycled your mums old school trunk, thats such a good idea! I could really use some of this inspiration for my landlord furniture packages. beautiful and such great images….I am very jealous of your inspirational place! Thankyou, thankyou, thankyou! You have managed perfectly what i’m trying so hard to achieve in our new build house. With the help of your page i’m sure I’ll pick up a few pointers and if my home ends up looking half as beautiful as yours i’m a very happy lady! Now where to start…….. 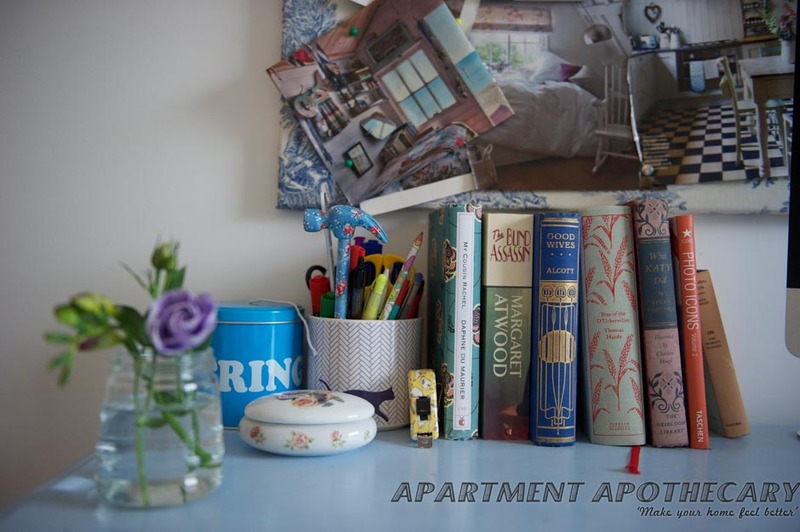 Your apartment is really charming; you’ve blended the old, the new and the meaningful together beautifully! Love everything about your Home! 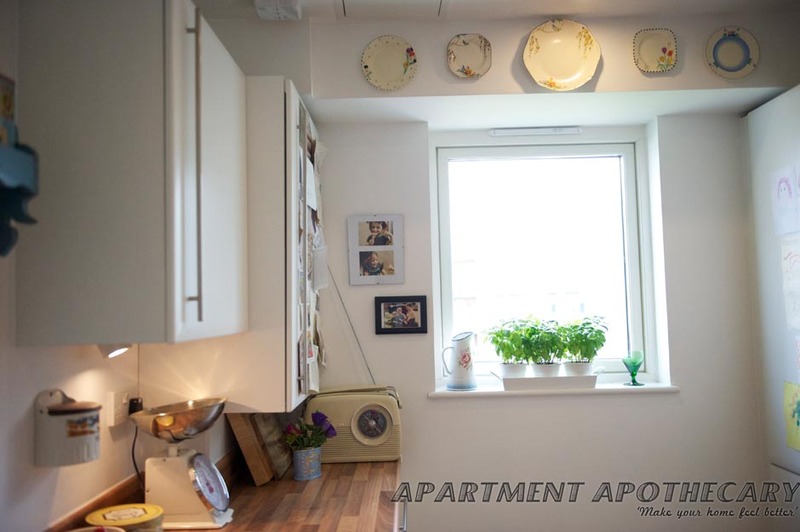 Some great ideas..
Just moved in to a new apartment and been struggling with exactly this. So hard to not make it look and feel sterile and finding it tricky to incorporate older furniture. You’ve managed it so perfectly! Going to be coming back to this post a lot for tips!